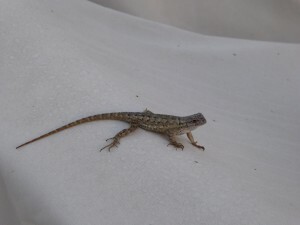 Sometimes, when you rescue a lizard that has gotten into the pool and can’t figure out how to get out, all it wants to do is get as far away from the water as possible. 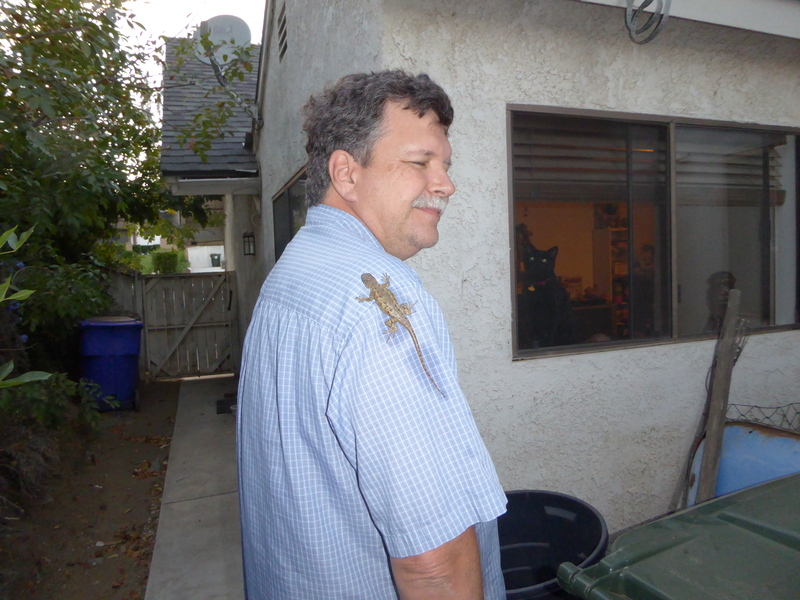 That is when you end up with a lizard on your shoulder. When you take the lizard on your shoulder over to show to your daughter through her bedroom window, sometimes a cat gets in the photo. Then, when you try to carefully get the lizard off your shoulder, it crawls up onto your head. 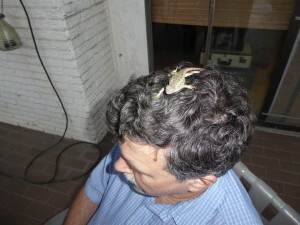 And you know you will have to let your wife and at least one daughter take photos of you with a lizard on your head. Then, to get him off your head,you need some help from your wife, who is pretty squeamish about things, but, thankfully, not about lizards. And, finally , you get the lizard of of you (although it really didn’t want to go because the water was cold and you are warm) and back where he belongs, in the back yard around the patio furniture. We have them all over the yard. At this time of year we see at least one every time we go outside. I like lizards. They eat bugs! I think the lil guy wanted to be adopted. Oh yes, they all do! Joey breaks my heart, as he wants so much love, but I promised Blackie no more disruptions to him life. So when I am at Room 8 I give Joey lots of love. The way you told the story sounds like the book, “If You Give a Mouse a Cookie”. Who is Joey, and where is Room 8? My post on June 12th talks about Room 8 and Joey.